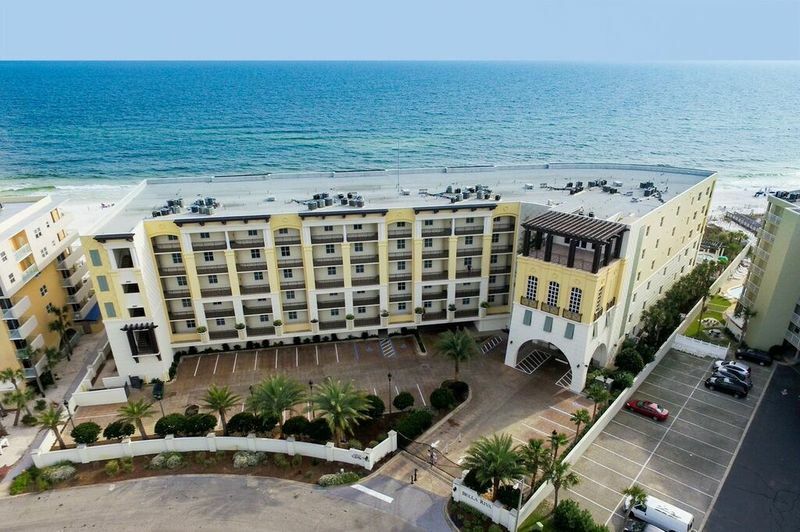 Welcome to Bella Riva 108, a mediterranean-style, gulf front vacation rental on Okaloosa Island. This luxurious condo is spacious and fully equipped for travelers. 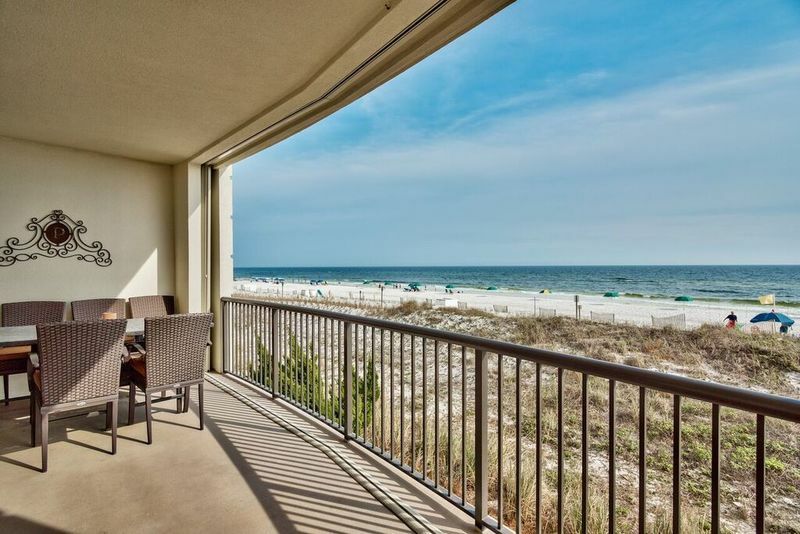 With gorgeous gulf views, high-end furniture, and upgraded appliances, all that will be left to do is hit the beach and take in the Florida sun. Okaloosa Island is an amazing area with much to offer. Just a two-minute drive away you’ll find restaurants like The Crab Trap, Rockin’ Tacos, and Angler’s Beachside Grill. Some of the areas best activities are also just around the corner such as the Gulfarium Marine Adventure Park and Wild Willy’s Adventure Zone. 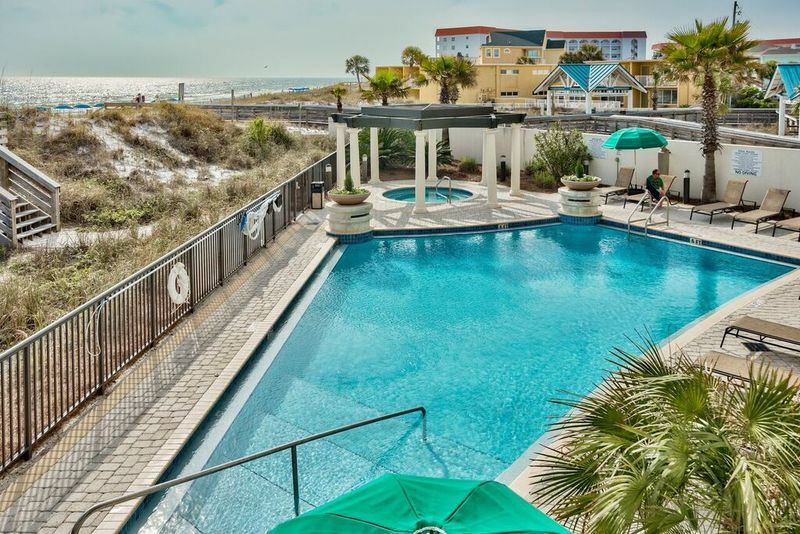 With activities so close, and a luxury condo like this, you’re vacation will be the best one yet! Upon entering Bella Riva, you will immediately be drawn to the architecture of the complex. A mediterranean feel starts your vacation off right! The entrance to the unit leads the guests down a hallway to the main living area with a wall of large sliding glass doors featuring an amazing view of the Gulf. This area is exceptionally spacious and open to the kitchen and dining area. A leather sectional with coastal blue hues welcomes guests to front row seats to the view. A farmhouse style table seats eight for family meals or game night. An expansive kitchen provides guests with plenty of counter and cabinet space for making home-cooked meals. Luxurious double doors leads to the master bedroom. 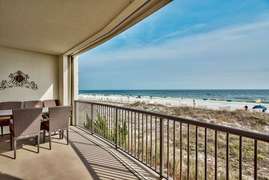 Beautiful views of the Gulf seep in through the sliding glass doors that lead to the balcony. The private bathroom is spacious and features a soaking tub, standalone shower, and his and hers vanities. 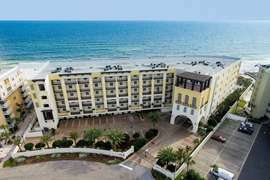 A queen bedroom also offers views of the gulf with access to the balcony and a private bathroom. From the balcony, guests can lounge and listen to crashing waves, and also view the community pool. Two additional queen bedrooms are towards the north side of the condo, one with a private bath, and one sharing a bathroom with the main living area. Wash the sand out of your clothes with ease in the Samsung washer and dryer. 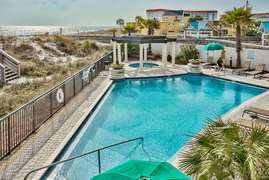 The community pool is also gulf front and is furnished with lounge chairs and umbrellas for guest use. Splash in the pool or relax is the hot tub while taking in the ocean air. Bella Riva 108 has everything you need in a vacation rental and more! Book this luxury unit today!